Friend lent me this as we both wanted to get it done before (if?!) the film is released in Korea. Quick read and well worth it I think despite some reservations. Firstly, the thing I liked most about the book was the ingenious way the writer weaves reality and imagination together. This is the book’s undoubted strength for me because it makes the book work really well on a psychological level. If you like, the book is designed very well with this motif of truth v imagination utilised both at the novel’s core and as the overriding packaging for the writing. If you haven’t read it, you may be wondering what I mean. I can’t say more or I’ll spoil it. Just read it! I thought the central character, Briony was well-crafted too. Adults writing children can go so very wrong. Men writing women can suffer too. That McEwan has pulled off a female child so well is a testimony to his sublime creative skills. Other characters were more or less all right but there were times when I thought there was an imbalance. For example, in Part One, McEwan takes painstaking detail in one chapter to bring to life Emily, Briony’s mother. This seems at odds with her role later in the book; she doesn’t reappear again. He does the same with Robbie, Emily’s victim but doesn’t for Cecilia, her older sister who plays a central role in the story. I couldn’t figure out on what basis McEwan had decided who to describe and who not to. There didn’t seem to be any rationale. As a whole, the story is good, but not as powerful as I thought it was going to be having finished part one. The book got weaker in terms of plot and writing, I felt, as it went on. This is not to say it wasn’t engaging. It was but these were highlights rather than the entire story: the march to Dunkirk, the first intake of wounded at the hospital – both were excellent descriptive scenes. As the book ended, I felt that it hadn’t really reached the crescendo I expected. I wasn’t sure why. 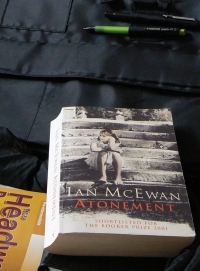 Having now read right to the end, it seems possible that McEwan had Part One as a story many many years ago and developed the rest either over time or more recently. It certainly seems that part one stands out to me much more than the rest of the book. But a good read nonetheless. Cover Shot: I finished this on my way to teach one of my private business students, hence the bag. The play – for which Briony had designed the posters, programmes and the tickets, constructed the sales booth out of a folding screen tipped on its side, and lined the collection box in red crepe paper – was written by her in a two-day tempest of composition, causing her to miss a breakfast and a lunch. it’s true about the old not needing sleep – at least, not in the night.